Android recently launched new version Lollipop 5.0 and it gives the unique feel to the users. 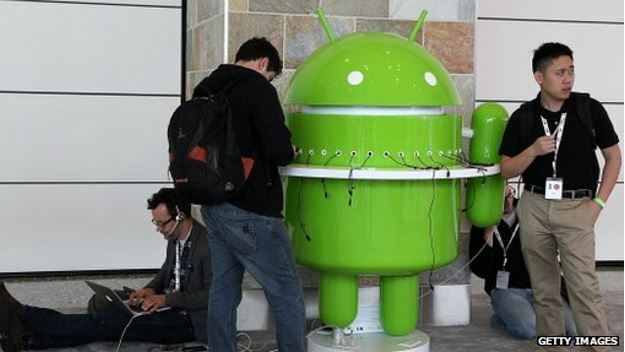 It is promising more security than the previous versions of the Android operating system. It is important to get more secured device in this threaten world. Android Lollipop have new lock screen and the system also having the Advanced smart lock feature. Now one more security feature it promises to secure the Entire phone data by Encrypting the Phone. Follow our guide on How to Encrypt Android 5.0 Lollipop device for security purpose. 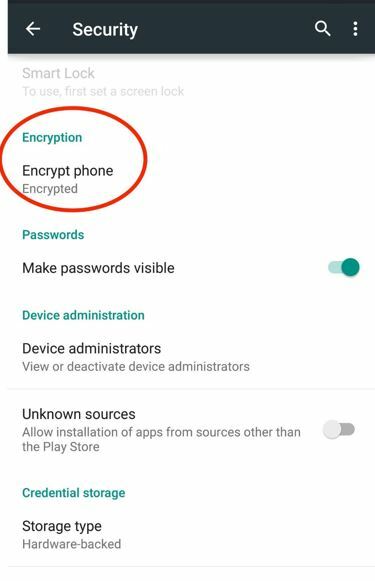 Phone Encryption encrypt the files, apps, settings and accounts everything inside the phone and to decrypt the data you need to give pattern or password you gave while you power on the device. The other way to decrypt the phone is to perform the factory data reset which erase all the phone data. All new devices will come with the Encryption enabled by default. But if you want to Enable the Encryption in existing Mobile phone, you need to upgrade your older version to the Newer version i.e. Lollipop and then you have two options available to encrypt the phone data. 1) The first and easy working method to enable encryption is from the Settings > Security. Inside the security you’ll find the Encryption option and by tapping on Encrypt Phone you are forced to Secure your Phone data but as this entire encryption process may take hour its recommended to fully charge your phone before going through this steps otherwise you may loss your data. This entire process time depends on the data you already have in the device. 2) Another method of Making the encryption of device though Factory reset. When you’ll do the hard factory reset then your device will work as the brand new Lollipop phone and encrypt entire phone data. Enable factory reset by tapping the Settings> Backup & Reset > Factory Reset. It’ll take some time to factory reset the phone and assign the new function of Encryption as it comes with the new Lollipop devices. Note – For Above two methods to work you need to First Upgrade your Existing version to Lollipop. Start upgrading your phone to the Lollipop to make it more secure than ever ! Internet is the big source of Information but today it becomes the source of threats and malicious contents. Lots of attacks are going online link fraudulent transaction of money, stealing private data, sending spams etc. So if you are not taking all that matters seriously then you might be the next victim by the attackers. Using internet for getting informative materials, Using social media to connect with friends and to share contents with them is the important for our daily life and we can’t leave without it. But securing our side from the attack is our responsibility. Several attacks like SQL Injection, Phishing, XSS (Cross Site Scripting) are happening today. So security awareness is important. It also provides the Anti-Clickjacking and Anti-XSS Protection. So to remain protect against the browser exploitation just install it and start using this add-on. If you trust any site than allow that site permanently to run on your browser. 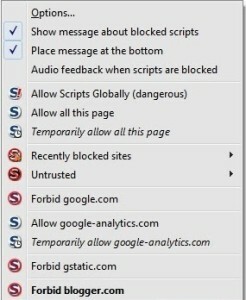 Add the sites into white-list from the Firefox add-on options which you trusts or wants the script to be run. This tool is tested and verified by the security researchers and considered as the best security framework for the browser. To remain secure in this threaten world is difficult now a days. Dangerous Malwares and viruses coming rapidly on the internet. Its ok if you are not using the internet but if you are connected with the internet then its not guaranteed that you are secured. Security awareness is really important to stay secure. Recently Android NotCompatible Malware hits massive Android phones and it came with the Most sophisticated code which causes danger and harden to detect. Today Symantec discovered virus and its the spyware named Regin. Regin is also most sophisticated and harder to detect. It does things like stealing passwords, recovers deleted files, captures screenshots when its gets installed to the computer. Regin, was probably created by a government and has been used for six years against a range of targets around the world – Symantec said. Symantec says that the Regin has been used to spaying the government organizations and businesses, also the private individuals. Symantec feels like Regin comes from the Western organization. Bug, Regin targeted many computers in Saudi Arabia, Russia and Ireland and hit by the Attack – Experts said. 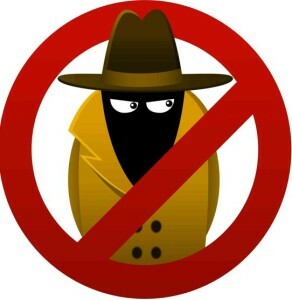 The Main goal of the spyware developer is to steal some confidential information from organizations. using internet is now everybody’s job and more and more businesses are moving online day by day. So its our responsibility to protect our private and confidential information. So its better to use the genuine software into your computer or mobile and never download software from the untrusted sources even they promising to give more. Otherwise you might be the next target by the attackers and bad guys can damage you by using your information or devices to do malicious activities. Security researchers found new Malware Named NotCompatible which steals the information from the Android phones which gets infected by the virus. If you are using the Android Phone with the Internet then you must awake and use it with care. Mobile security research firm Lookout stated this malware as the most Sophisticated and its harder to defeat it. NotCompatible steals the Phone call logs and even pictures and other personal information from the targeted Android device. This Malware threat first found in late 2012 and now Security researchers group found that the Malware NotCompatible re-written the previous malware code and make it harder to detect. Hackers forms one Bot network which target the Android devices and collect the private information of mobile devices and rented out to crime group. So its the very serious matter if you are using the Android mobile connected to the Internet. Bad guys uses that collected Victimized Android network to target any Website and blog, send bulk spam emails or even used to buy tickets in bulk and sold out later to get more profit. Lookout team working harder to detect the Malware and provide the best security solution. “This is the most technically sophisticated threat we are facing and it’s the most worrying to us” – Said Jeremy Linden, a security analyst at Lookout. People using now a days Mobile devices more rather than the Desktop because they loves to stay connected on the move. Malware makers targeted writing Complex codes for the Android devices and targeting the Android users to form the malicious network which in turn gets used to target any system or network. They (Bad guys) remains undetected and only your Android device information found if traced back by analyst and you could be responsible for any crime. So be aware and its better to use the Mobile applications with care. Never download the Applications from the unknown sources because malware comes in form of packers. According to report Majority of Malware written for the Android devices and less for the iOS devices. Wirelurker and Masque targeted few iOS gadgets earlier.